To anyone who has worked in submillimeter astronomy or technology during the past four decades, Tom Phillips is a name that is instantly recognized. He has been an innovator in developing new receiver technologies, a pioneer in pushing the detection of important spectral lines, and a leader in developing new observational facilities. Tom has used radio, optical, and airborne telescopes for his research and has worked painstakingly to develop telescopes and facilities specifically for submillimeter astronomy, notably the Caltech Submillimeter Observatory (CSO) on Mauna Kea, and the Herschel Space Observatory (HSO) launched earlier this year. Over 120 participants gathered on February 23-24, 2009, in the Hameetman Auditorium of the newly constructed Cahill Center for Astronomy and Astrophysics on the campus of the California Institute of Technology in Pasadena to recognize Tom's numerous contributions over four decades with a correspondingly broad-based symposium. 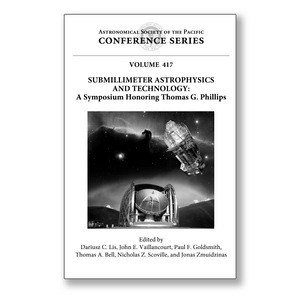 The oral and poster papers included in this volume give a snapshot of the varied areas in which Tom has worked and made such important contributions, as well as provide an overview of the state of the art in submillimeter astronomy, receiver technology, and observing facilities.